Richard became known for his pioneering work as Head of Grange Primary School, Long Eaton, UK. Previously seen as failing, the school was transformed into one considered a beacon in the field of education. I have spent most of my adult life working with the most creative, enterprising of people; people capable of dealing with uncertainty, with a thirst for exploring the unknown, for taking risks and for embracing a world of constant change and evolution. Before you get too excited and ask who they are and how you can head hunt them, I need to confess that they are all under 11 years of age! You can discover more about Richard’s work via the following link. In the video above Richard describes the importance of focusing on the true purpose of our work. Like many practitioners, his words resonate with profound simplicity. It is not just theory; he has done it. Here is the official introduction to the video. Gerver began his working life as an actor who worked as an advertising copywriter to make ends meet. He began a teaching career in 1992 and rose through the ranks fast being identified by the school’s inspectorate in 1997 as one of the most outstanding teachers in the country. By 2005, he had won the prestigious School Head Teacher of the Year Award at the British National Teaching Awards for his work in leading a school on the brink of closure to becoming one of the most innovative in the world. Gerver works closely with Sir Ken Robinson who cites Richard as one of the world’s most exceptional educators; he features in Robinson’s best-selling book, The Element: How Finding Your Passion Changes Everything. He has been described as one of the most inspirational leaders of his generation. He argues, however, that great leadership is about serving the needs of the people that work for you and rely upon you. The three core principles that underpin Gerver’s philosophy are communication, empowerment and impact. 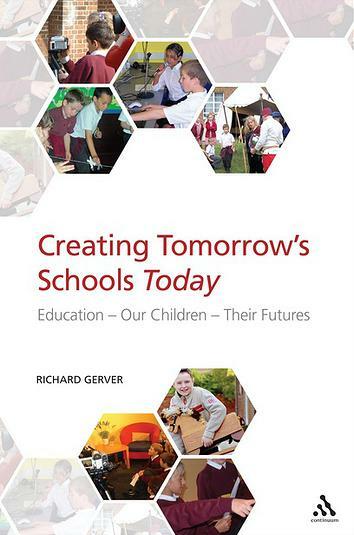 Richard wrote this book that outlines how we can help children develop the skills required for shaping their futures. Here is the official description. Education is the platform for our success or failure. The critical question is: is our system still fit for purpose? Will our children be equipped to face the challenges the future holds; the rapidly changing employment patterns and the global environmental, economic and social crises ahead of us? Or will our children grow up to resent their school years and blame them for their unfulfilled potential and achievement? Creating Tomorrow’s Schools Today explores these questions in the context of early schooling, primary education, some of the most formative and important years of our children’s lives. The book presents powerful arguments that suggest an imperative for change and will explore the possible strategies and thinking that can offer a solution. The author provides real context and concrete examples based on the incredible journey taken by one primary school, Grange. He shows how, by developing a creative and futures facing system, it not only evolved from being a school on the verge of failure to a school globally recognised for its success and innovation in two years but more importantly created a system that has equipped its children to be not only prepared for but confident in their futures. During the past decade Richard has been invited all over the world to describe how people, teams and organisations can develop. This has taken him into corporations – where his message has been well received – as well as the educational sector. 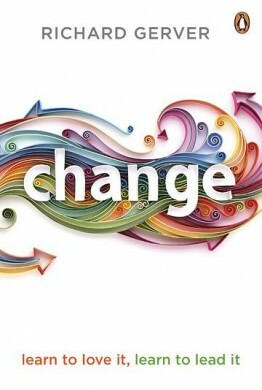 One outcome has been Richard writing the book called Change: Learn to love it, learn to lead it. Here is the official description, together with some responses. The pace of change is greater than ever. We all face new challenges every day in our jobs and in our personal lives. Those who can handle change are the most fulfilled. Those who fear change will find it hardest to thrive. As a head teacher, Richard Gerver famously transformed a failing school into one of the most acclaimed learning environments in the world – in just two years. He inspired staff and teachers to reach their full potential. As a hugely popular speaker and author, he now helps individuals and companies to embrace change. This book is his powerful personal reflection on change. Full of wisdom and practical insights, it will help you in any situation you face. Whether you are leading a company through change or looking for a new direction in life, let Richard Gerver be your guide. Finally, in the video below Richard explains the role of education in identifying each child’s potential. The video was filmed when he was speaking at a conference organised by what was then the Center for the Future of Elementary Education (CFEE) at Curtis School. This is now called The Center for the Future of Education and Democracy (CFED). You can discover more about the Center – and the vast resource of material it offers – via the following link.